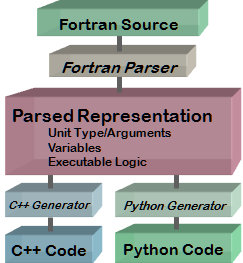 Objexx Engineering provides Fortran to C++ and Fortran to Python conversion services. Fortran conversions are the best solution for projects that wish to reap the benefits of moving to a powerful, modern language with a large developer pool, but the poor results of the available automated tools and the high cost of manually rewriting code has made such conversions rare. Objexx has designed tools and a process that can deliver a validated, maintainable code base that retains the structure and look of the original code to minimize project disruption. Conversions are performed by Objexx to assure successful results that an off-the-shelf tool cannot provide. Objexx brings its expertise to bear to find and fix bugs and to address the few areas of Fortran usage that are best dealt with by manual intervention. Objexx works carefully with clients to assess project needs and determine whether conversion is the right solution, as opposed to modernization or a hybrid application approach. An advanced Fortran parser front end was recently developed at Objexx to support a wider range of modern Fortran 2008 constructs and to separate the parser and generator components to allow multiple output languages to be supported. The Python generator was added to exploit this capability and support a language that is growing in popularity for science and engineering applications. Copyright © Objexx Engineering, Inc.